I do mostly figure painting, but I do a little bit of building models as well. To be honest, I could do without the building part, but I enjoy the painting and finishing. There is a local model kit show coming up in a few weeks on October 25th, so I was planning on finishing a model for that. I chose one of the kits that I won at the raffle earlier this year. 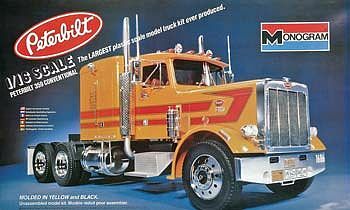 It’s a Monogram Peterbilt 359 in 1/16 scale. It’s actually a very nice raffle prize – I looked around online and the cheapest I have found is around $100. Naturally, I am not planning on making it that ugly orange and red I started building it last week. I have the bottom frame finished, but still have a long, long way to go in the building. I was wanting to give it a cool paintjob, and so I was thinking that using some sort of candy paint would look cool. I have already used the Spaz Stix airbrush paint for chrome effect, and so I got some more paints of that brand. Actually, those were not very easy to find. I contacted the spaz stix company to find some sellers of the airbrush versions of their paints, and they said they are not ordering any new airbrush ones right now, and are debating whether to discontinue that line alltogether. Apparantly, the airbrush versions are not selling as well as the aerosol ones. In either case, I was able to find a couple of sellers on e-bay that had them. I received the first one today – Spaz Stix Candy Red Apple. First I applied the black backer. I used different methods. On one I sprayed several thin layer to build up the shine, on another I applied all the paint in one sitting, and the third was somewhere in between. 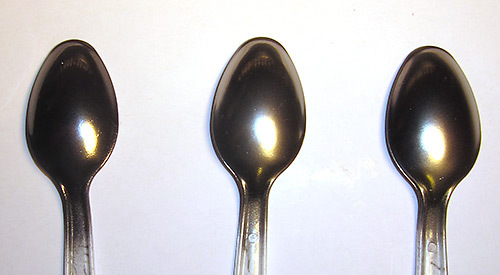 In the end, the three spoons were indistinguishable from each other. 3. 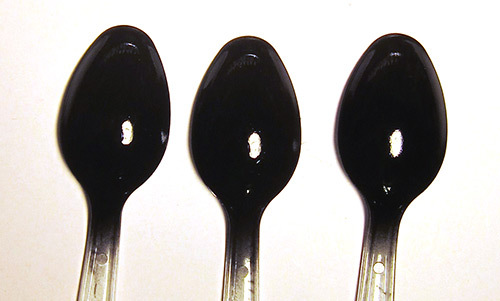 Just a couple of thinner coats. #1 and #2 are very similar. 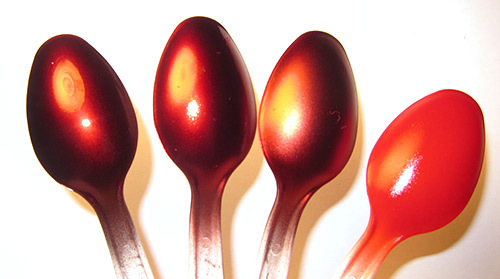 #1 is a bit darker and a bit shinier – I think that’s because I applied it on the darker, shinier chrome. #3 is more pink looking and not nearly as shiny (it’s hard to tell in the picture). And naturally #4 is very different.